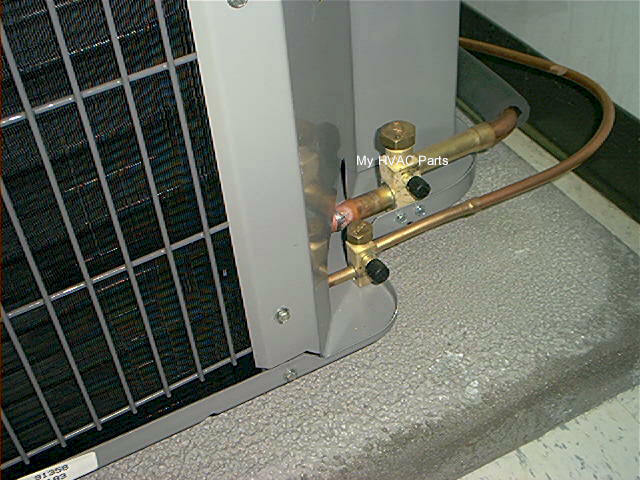 When the original installer sweats the copper joints with a torch he or she is supposed to be wrapping the brass valves with a wet rag to keep from burning the small seals that are in these valves. This unfortunately many times, doesn't happen. Once these seals are destroyed you either have to pay to install new ones or continually be adding freon. Of course there are other places to have freon leaks but this is a PRIME place to look. See leak finder solution below. To answer a question that gets asked over and over - NO you can NOT recharge a system yourself. It takes an E.P.A. Certification to buy or use refrigerants and it takes special equipment and knowledge to correctly charge an AC unit! There used to be "Kits" to re charge automobiles ( and still may be ) but there are NO SUCH "Kits" for re charging a residential unit. 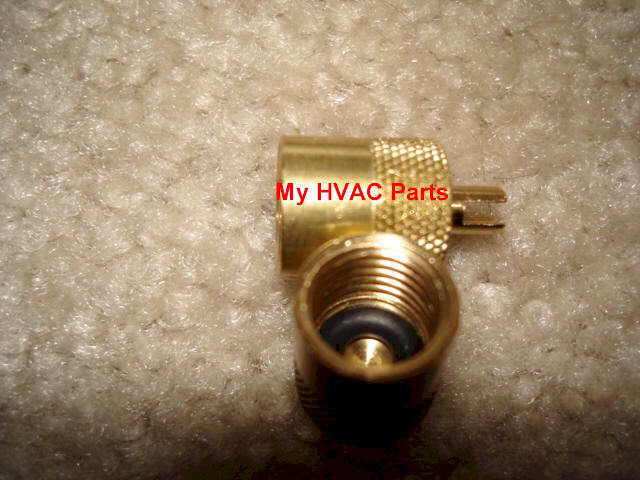 Once a Heating and Air Conditioning Contractor has properly re charged the unit with freon, you can use this kit by removing the larger and smaller hex brass nuts, use the tube of thread sealant on the threads of these brass caps and re install them, tighten securely but not too tight. 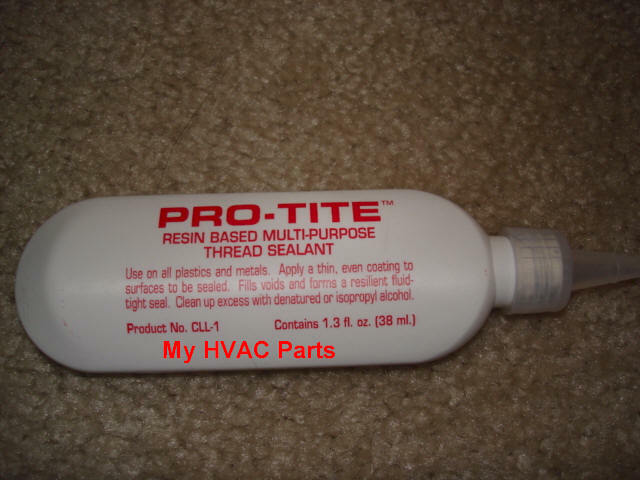 This thread sealant is made to withstand the chemicals in refrigerant and should correct all but the most severe leaks. Now replace the smaller caps with the caps in the kit. The caps in the kit have a special "O" ring inside to stop leaks. Your schrader core caps may look different than the ones in the photo below. The caps we supply are brass with a special tool at the end to tighten any small leaks at the schrader cores. (Always wear safety glasses and gloves). Don't use the thread sealant on these caps however. Some heat pumps need three or more schrader caps. These caps should be changed every couple of years. Just tighten them slightly more than hand tight. Here is a close up of the thread sealant. Here is a close up of the schrader caps. (2) Brass Service Valve Caps with " O " Rings and handy tool on end to tighten leaking schrader cores. (1) Tube of thread sealant ( To seal service valve caps ) and bottle of leak detector solution. 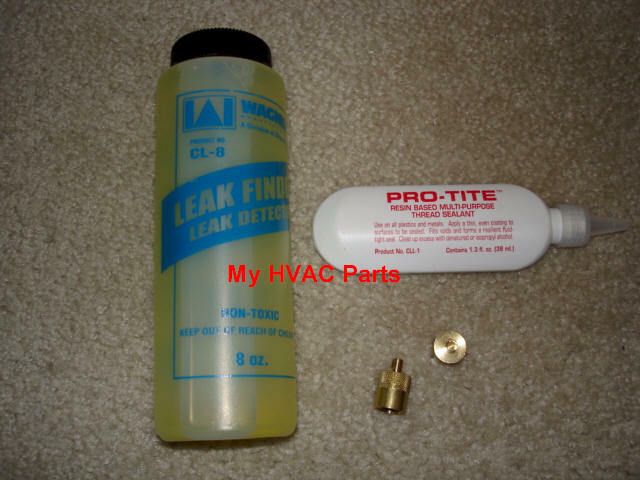 Order freon leak kit: (2) Service Valve Caps B10-473, Thread sealant B10-853 AND B81-166 leak detector.